Earwig Recording Artist, Chicago based Liz Mandeville, is headlining the Durban International Blues Fest Oct 2, 2010, in Durban South Africa. How cool is that? Lions and tigers and Blues! Well at least Lions and Blues. I asked Liz a few things about her upcoming trip. Let's see what she had to say! Monica: What are you most looking forward to in your upcoming trip to South Africa? Liz: I'm excited to be visiting the African Continent for the first time, and they've promised to take me on Safari to a national wildlife refuge. More than the fact that people in South Africa love American Blues Music, more than the fact that they play it and promote it, which is amazing, I'm excited to be experiencing a new culture with it's own food, wine, language, traditions & WILD ANIMALS!!! M: Africa seems like such a strange land to me, even in today's time. Do you have any concerns on traveling? L: Before I agree to go anywhere outside the USA, I always go to the US State Dept website & check on the travel conditions for that region. According to the State Dept, South Africa is a friendly, sophisticated, safe region. Of course, we live in an unpredictable world, but I'm off on an adventure! I can't wait to experience all it has to offer. M: Are you working on any new material? L: I'm always writing. Lately my interest has been the experience of being married to a soldier on active duty in the US Army. I've written several songs about our long distance love affair & navagating the waters of life on my own as I wait for him. I'm also working on expanding my guitar playing, learning some classic blues guitar instrumentals & solos. M: And, when can we expect to hear from you? L: Although I'm not currently in the studio, the band & I are creating a concept for the next CD. When I'm not recording, I'm playing gigs. When I'm not doing that, I'm writing. I'm a regular contributer to www.chicagobluesguide.com , where I have a column called "Inside The Blues." Over the summer I wrote a series of revues for them and I just finished doing an indepth interview with Tommy Castro. I'm also still transcribing the second half of an interview I did last year with Tail Dragger, which was pretty juicy! M: Anything you would like to add? L: My friend Lynne Ormann is producing a show in November to welcome the troops back home & celebrate the contributions of Illinois Veterans. She's calling it Red White & Blues. I am honored to be among the artists she's asked to perform for this historic event, which she plans to record & broadcast on cable TV. I'll be giving you more info on this as the event progresses. 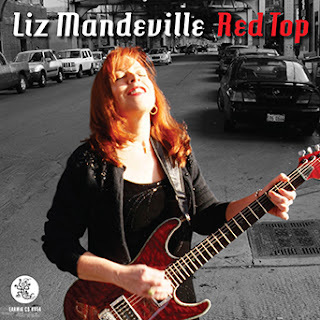 Liz, an award winning songwriter, singer & guitarist released her 4th CD, Red Top, for the internationally distributed label in 2008. It shot right to #3 on the RootsTimeRadio Charts & stayed in the top 20 for 22 weeks. Her original song from that release, Scratch the Kitty, is still in the Cashbox top 20 more than two years after it's release. Liz, a petite red head, known for her remarkably versatile voice, insightful songs, humrous onstage patter and deeply traditional guitar work is also an accomplished Louisanna washboard player. Her performance at the 2009 Low Country Blues Fest, fronting her trio The Blue Points, earned a standing ovation from the enthusiastic crowd, whipped to a frenzy by Mz Liz and her groups insistent rhythms and irresistable blues! Liz Mandeville (formerly Liz Mandville Greeson) has produced 4 all original CD's for Earwig Music Co. over the last 14 years. She won the 2005 International Songwriting Contest for her humerous cabaret blues tune "He Left It In His Other Pants." She was a finalist in 2006's USA Songwriting contest with her "Juice Head Man" a deeply personal blues that draws inspiration from her blues influences. In 2008 Liz was nominated Songwriter of the Year by the American Roots Music Assn.